College GameDay (branded as ESPN College GameDay built by The Home Depot for sponsorship reasons) is a pre-game show broadcast by ESPN as part of the network's coverage of college football, broadcast on Saturday mornings during the college football season, prior to the start of games with a 12:00 p.m. ET kickoff. In its current form, the program is typically broadcast from the campus of the team hosting a featured game being played that day (such as one being broadcast by an ESPN network or ABC), and features news and analysis of the day's upcoming games. It first aired in 1987 with Tim Brando as host and Lee Corso and Beano Cook as commentators, giving an overview of college football games, but the show underwent a radical transformation beginning in 1993, and began incorporating live broadcasts. Today, the only original cast member remaining is Lee Corso. Rece Davis serves as host and Kirk Herbstreit is Corso's counterpart. Desmond Howard was added to the cast of the show in 2008. Craig James served as an analyst from 1990 to 1995. Erin Andrews joined the GameDay crew as a co-host and contributor in 2010, replaced in 2012 by Samantha Ponder. In 2015, Rece Davis (also host of the college basketball version of GameDay) replaced Chris Fowler as host of the show. In 2010, the program was expanded from two to three hours, with the opening hour broadcast on ESPNU until 2013. The show is known for its prediction segment that appears at the end of each broadcast. Typically there are three predictors: Corso, Herbstreit, and an invited guest, usually a celebrity, prominent athlete, or radio personality associated with the host school for that week. The show always concludes with Corso's prediction for the host school's game, after which he dons the mascot's headgear of the team he predicts to win the game, usually to the ire or excitement of local fans. 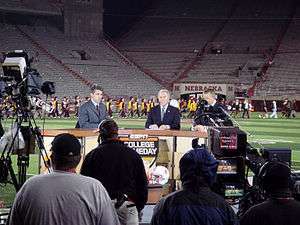 The GameDay crew record a post-game segment for SportsCenter at Nebraska on September 15, 2007. In 1993, GameDay began broadcasting live from outside a stadium hosting a game most Saturdays. The selected stadium is usually hosting one of the biggest matchups of the day, regardless of whether the game airs on an ESPN network. The first show "on the road" took place at South Bend, Indiana for the match up between #2 Notre Dame and #1 FSU. The show takes on a festive tailgate party atmosphere, as thousands of fans gather behind the broadcast set, in view of the show's cameras. Many fans bring flags or hand-painted signs as well, and the school's cheerleaders and mascots often join in the celebration. Crowds at GameDay tapings are known to be quite boisterous and very spirited. Flags seen at the broadcast are not limited to those of the home team; for example, one large Washington State flag can be seen at every broadcast, regardless of the location or the teams involved. 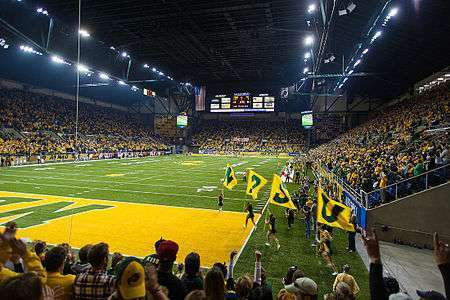 The idea began in 2003 on WSU online fan forums and has resulted in the flag being present at more than 159 consecutive GameDay broadcasts since 2004. The show's current intro and theme music is performed by country music duo Big & Rich, who perform their 2005 crossover hit "Comin' to Your City" with revised lyrics that mention several top college teams and a guest appearance by Cowboy Troy. Rap artist Travie McCoy (of Gym Class Heroes) now appears in the intro for this show, starting with 2014 season, as well as Lzzy Hale, lead vocalist and guitarist of the rock group Halestorm. Additional music that has been used for the show include "Boom" by the rock group P.O.D. and God Bless Saturday by Kid Rock. 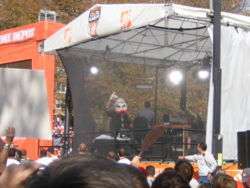 At Virginia Tech in November 2005, Corso picks Miami to upset the Hokies. Note the head of Sebastian the Ibis. Typically, the show will end with Lee Corso and Kirk Herbstreit issuing their predictions for that day's key matchups, finishing with the game to be played at the stadium hosting GameDay, for which Corso signifies his prediction by donning the head piece of the mascot of his predicted winner. Starting with the 2009 season, a celebrity guest picker gives picks for the day's key games alongside the GameDay regulars (such as Bob Knight when GameDay aired from Texas Tech in 2008, or NASCAR star Dale Earnhardt Jr. when GameDay aired from Bristol Motor Speedway, a NASCAR track, in 2016 also Verne Lundquist in Tuscaloosa, Alabama due to his Final Season calling College Football games on CBS). Prior to 2009, this was not done on a regular basis. Herbstreit, who in 2006 became a game analyst for ABC's Saturday Night Football, is not allowed to make a pick for the game at which he is assigned due to parent company Disney's conflict of interest rules; however, he is allowed to give one or two keys to the game this also applies to Verne Lundquist on Saturday October 22, 2016 because Verne Lundquist called Alabama vs Texas A&M with Gary Danielson and Allie LaForce. In past years, when no suitably important game was available, it would originate instead from the ESPN studios. College GameDay was also a source for many arguments regarding the purported east coast bias: From 1993 until 2004, GameDay had only been to two regular season games on the entire West Coast (1998 at UCLA and 2000 at Oregon). Given the popularity of the show and the media coverage it brought to the highlighted game, teams and fans of the West Coast teams felt that the show was only magnifying the perceived problems with excess media focus on East, South and Midwest games; ESPN attributed its lack of West Coast games to the need for a very early start time (07:00 AM PST) and an alleged lack of high quality matchups. With the addition of the Saturday Night Football game on ABC in 2006, GameDay has increasingly aired from that game. This could be done for many reasons including the fact Kirk Herbstreit is on both programs, thus making it easier for him. Another reason could be to give the Saturday Night Football game added exposure. Beginning with the show's 21st season (2007), College GameDay began broadcasting in high-definition on ESPN HD. College GameDay expanded to 3 hours, with the first hour being televised on ESPNU beginning September 4, 2010. In addition, ESPN Radio simulcasts the television version from 9am-noon ET. Other changes include the addition of a female contributor—first Erin Andrews in 2010 and 2011, and then Samantha Ponder (then known by her maiden name, Samantha Steele) after Andrews left ESPN for Fox following the 2011 season. Both Andrews and Ponder have anchored several segments during the first hour on ESPNU, contributed during the ESPN portion, and also worked as a sideline reporter on the game from which College GameDay originated, if it aired on one of the ESPN family of networks (i.e. ESPN, ESPN2, ESPNU, ABC). Beginning with the 2013 season, the third hour moved to ESPN and was hosted by Fowler. As previously mentioned, beginning with the 29th season (2015), Rece Davis (who is also the host of the college basketball version) replaced Chris Fowler as the football version's new host. Fowler, in turn, was reduced to play-by-play duties on ABC's Saturday Night Football. Also on September 5, 2015 in conjunction with Davis' hosting debut, College GameDay debuted an entirely new on-air look, along with a new program logo, new theme music and new graphics. Division I-A/FBS rankings are from the AP Poll at the time of the game. FCS rankings are from the STATS LLC poll at the time of the game. 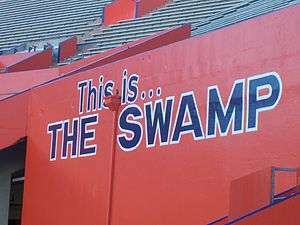 The Florida Gators have been featured on GameDay 37 times, which makes them tied for second with Ohio State for the most total appearances. 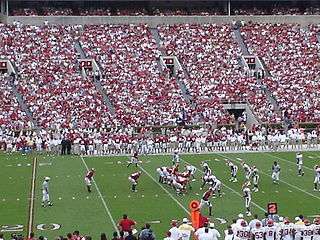 Alabama has hosted GameDay 16 times, more than any other team, and has made a total of 38 appearances on GameDay, also more than any other team. The first three broadcasts were from Legion Field in Birmingham. 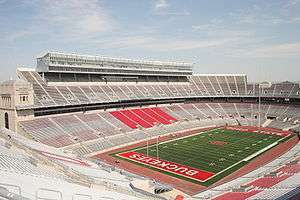 Ohio State has hosted GameDay 14 times on campus, more than any other school, and are currently tied with Florida for second in most total appearances. Alabama is second when it comes to on-campus visits, at 13. Air Force is the only "Group of Five" school to have hosted GameDay three times. North Dakota State is the only FCS program to host GameDay twice (Harvard has been featured twice, for one home game and one road game). Washington State has been featured twice, but GameDay has not yet visited Martin Stadium (pictured). A Washington State Cougars flag has flown at every GameDay broadcast since 2004. With the completion of the 2014 season, the SEC became the first (and is currently the only) conference to have all of its members host GameDay at least once (although Missouri has never hosted while an SEC member; it hosted as a Big 12 member). The SEC has also hosted GameDay more than any other conference. ↑ Archived October 30, 2011, at the Wayback Machine. 1 2 3 4 Archived October 11, 2007, at the Wayback Machine. ↑ Steward Mandel, Burning questions about BCS, a few candidates for Tennessee and more, SI.com, November 12, 2008, Accessed November 12, 2008. ↑ Michael Hiestand, 'GameDay' flag relay is worth a salute, USA TODAY, October 30, 2008, Accessed November 12, 2008. ↑ "Ol' Crimson Booster Club - Waving the Washington State University flag on ESPN College Gameday since 2003. Keep the WSU streak alive, donate today. Go Cougs!". Olcrimson.org. Retrieved 2015-11-29. ↑ As Mark Gross, coordinating producer of GameDay, noted: "You're asking a thousand people to show up 12 hours before the game starts [. . . ] By no means are we ignoring (USC). We always discuss the possibility. But the time is something to think about." Patrick Kinmartin, What time is it? Time for 'College GameDay' to make its way to L.A., The Daily Trojan, April 8, 2004. ↑ Archived July 15, 2010, at the Wayback Machine. ↑ "ESPN College GameDay Year-by-Year". Stevesams.com. 2011-01-13. Retrieved 2015-11-29. ↑ "ESPN College GameDay Coming to Blacksburg | TechSideline.com". Virginiatech.sportswar.com. Retrieved 2015-11-29. ↑ "Verge Saturday A Week-Long Interactive Celebration Of College Football". Sports.espn.go.com. 2001-09-04. Retrieved 2015-11-29. ↑ "Scoring Summary (Final)". Archived from the original on November 23, 2011. ↑ "Google Fusion Tables". Google.com. Retrieved 2015-11-29. ↑ "The last time College GameDay visited every SEC school". Saturdaydownsouth.com. 2015-08-06. Retrieved 2015-11-29. Wikimedia Commons has media related to College GameDay (football).